Scouting Report: Chiang is a good offensive player with a really nice left-handed swing. Potential to hit for both average and power - makes great contact. Pure hitter, however he really needs to work on his patience at the plate. 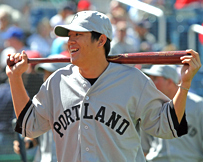 Defense at second base was below-average, so Chiang was converted to the outfield in the 2008-09 off-season. On the positive side, he has average-to-above-average range and a strong arm. Still, he's had some fundamental lapses in the field, commits a lot of errors, and his hands aren't all that great. He has been well ahead of the track age-wise during his rise through the Sox system.